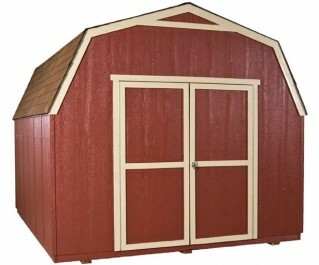 This medium-sized yard shed features classic barn styling and the extra wide door opening easily accommodates lawnmowers, tractors, bicycles and other gardening equipment. With 25-year asphalt shingles, resilient wood siding and a strong wood frame, our yard shed will outlast the backyard storage solutions found at big box stores – only for much less. Be sure to check out our wide variety of functional and decorative accessories to maximize your investment. Adding a shelf and workbench can double a shed's storage capacity and give you extra workspace. To complement your workshop and overall yard appeal, consider adding a window with flowerbox. Double door opening: 64" W | Height: 70.25"
Your local building authority may have specific requirements resulting in additional cost. Prices do not include painting, staining, permits, zoning and setback advice and/or compliance, excavation, or leveling beyond 6". All prices and content are subject to change without notice. Promotions are valid with online transactions only and cannot be used in conjunction with promotions at a servicing sales/distribution center or distribution center. Not valid on prior purchases. All stated sizes are nominal dimensions and approximate. Some sheds may be shown with optional items. Additional mileage charges (if applicable) and taxes will be calculated after checkout process is completed. 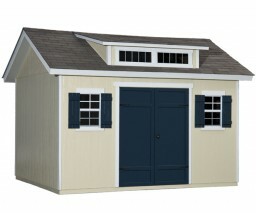 Painted 10 x 12 yard shed is a representation only, arrives primed for painting in a light beige color. More than 3 years and shed is looking great. Shed was built more and than 3 years ago and has been through 3 harsh winters with some 3 foot snow falls and it still looks like new. One small trim piece loosened up on the door which was an easy fix. That’s it. Great shed for someone who doesn’t have the time to build one themselves. I'm glad I bought from Shed Liquidators. I am very happy with my Shed. I've had it over a year now and I have no complaints or problems with it. My Installer did a great job and was finished in less than a Day. We had a new shed built last fall and it has held up well so far. There is a gap between the doors as they seem to have warped. We caulked the seams and painted the shed as quickly as we could after it was built. It is much too early to rate its durability; that will come after a few more years. I've been very happy with this purchase. The shed is perfect and I love the loft. It holds all of my lawn equipment as well as a workbench that I built. 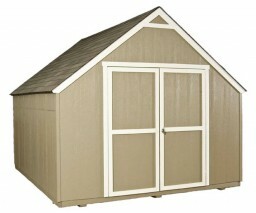 Great shed at a great price. I have had this shed now for 3 years and it has held up great. I live in the northeast and heavy snows and high winds have had no negative impact on this shed. 1 small piece of trim came loose on the door but that was easily fixed with 2 screws. It comes fully primed and ready to paint. My paint still looks new and isn't flaking off anywhere which shows that the primers they use on the siding is done right. I did get the vent and drip edge options which should be mandatory if you want the shed to last. The doors are still square and do not sag. The only way to get a cheaper wood shed is to build your own. Great shed for the cost. Installation was quick. I'll be getting another soon. We purchased the shed about 4 years ago and really love it. It is sturdy and well built and certainly very reasonably priced. Its solid and well built. I highly recommend. The shed was installed in one day. Craftsmanship of the installer was great. The shed is what I expected when I ordered it. Learn about our shed installation process here. 3' of clearance around your entire yard shed is required. 4' if larger than 160 sq. ft.